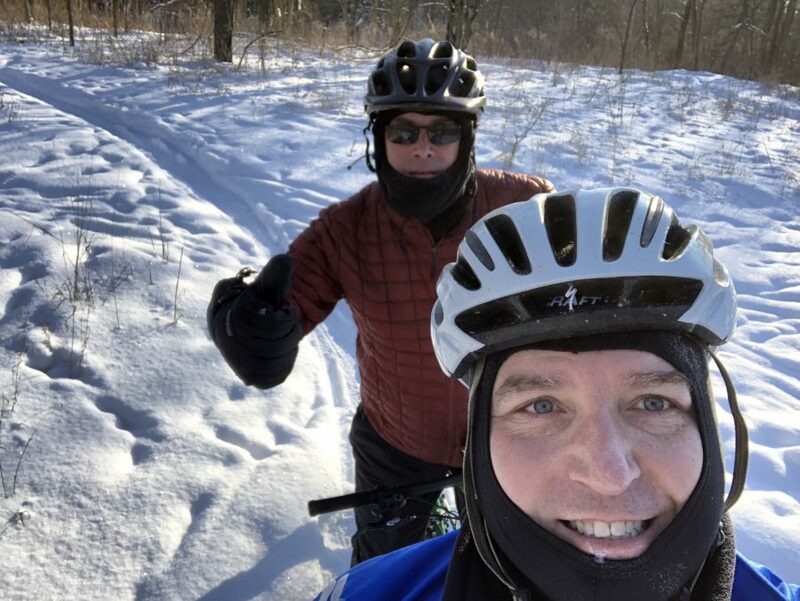 Robert Bishop, in back, is shown with his friend Mike Cusick on a snow covered bike trail. Bishop rides as often as he can during the winter months. KOSCIUSKO COUNTY — When the snow flies, many bicycles sit in storage or under a cover. But not everyone curtails cycling activities during the winter months. And due to the increasing popularity of “fat tires,” bicycling in the winter season is no longer an impossibility. Fat tires range in width from about 3.5 to 4.5 inches with a 26-inch diameter wheel, noted Barry McManus, owner of Trailhouse Village Bicycles in Winona Lake. The tires are especially designed for snow and ice covered trails, he said. Rob Bishop is an avid cyclist during the winter, especially on the Winona Lake Trails. He said he moved a few years ago to be closer to the trails. Fat tires, he said, mean “you can ride in places you can’t take an ordinary bike.” Exercise and being with friends are the primary reasons he chooses to ride in the winter. “I like to hang out with friends and have a good time,” he said. “It’s not a fast sport,” during the winter months. When it is snowy, Bishop brings out the fat tire bike and when it is frozen, but not so snowy he has a regular mountain bike. But there are still limits and when more than 4 or 5 inches of snow is covering the trails and they have not been groomed, “we are out of luck,” he said. He bundles up and wears layers of clothing along with ski gloves. “About 10 degrees is the limit for me,” Bishop said. Riding in the winter months requires an obvious investment in special clothing and gear. “Keeping the wind from getting through is the biggest obstacle,” McManus said. Common gear includes insulated wind stoppers with nylon material and also winter cycling gloves. Special devices can be mounted on the bike handlebars to allow mitts to be placed inside. Pardee Gunter, a retired teacher living in Leesburg, said he tries to ride whenever possible during the winter months, though not every day. He has three different bicycles including one for summer and dry weather, a second with fenders for wet riding and a third one, a mountain bike with studded tires, to ride in the snow. “I don’t bike in the bitter cold,” he said, noting wind chill is usually a big factor and 15 degrees is about the cutoff, depending on the wind speed. Wearing layers of clothing is a key, he said. “I have a winter coat with a waterproof liner that repels the wind,” Gunter said. His feet are covered with wool socks and boots. And he also uses the device mounted on the handlebars he can insert his mitts or warm gloves inside. At the age of 35, now more than 30 years ago, he decided it was time to bicycle for exercise. “I can’t stop now, it has become a habit,” he said. Although once in a great while Gunter will ride and not have a particular destination in mind, he usually prefers otherwise. “I like to have a place I need to be,” he said, such as checking the Warsaw Biblical Gardens he maintains. Riding between Leesburg and Warsaw can be challenging because there are no off-road trails between the two towns. Gunter said utilizing the old roadbed of the former Winona Interurban Railway might be an option for placing a trail someday. Gunter has literally bicycled across the entire United States, a feat he pulled off during four summers when he was still teaching school. In addition to the Winona Lake Trails, winter bicyclists also ride at Bonneyville Mill County Park in Elkhart County, Morsches Park in Columbia City and Franke Park in Fort Wayne. 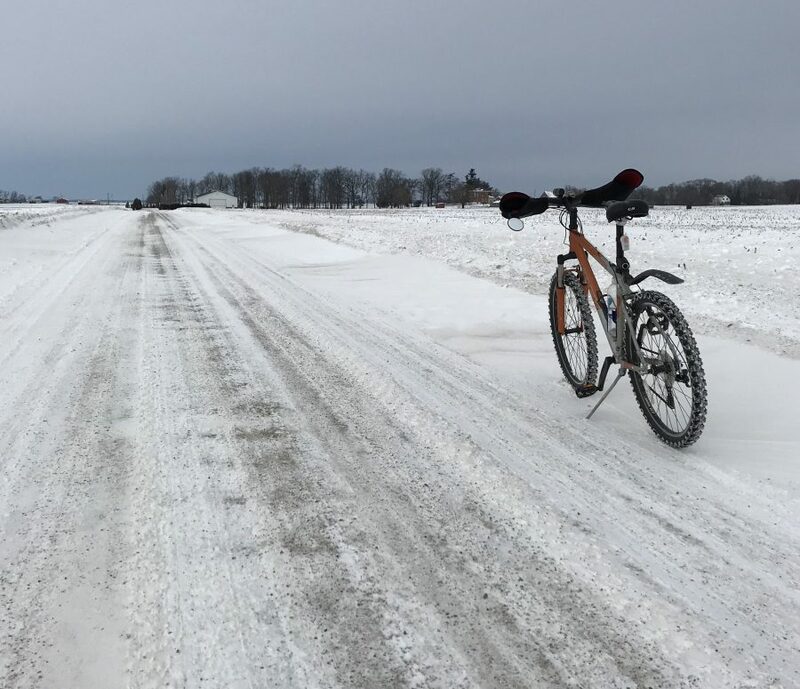 Pardee Gunter provided this photo of his bicycle parked along a snow covered roadway in Kosciusko County.